An Egyptian court has sentenced to death 21 defendants over clashes between rival football fans at Port Said stadium in which 74 people were killed last February. 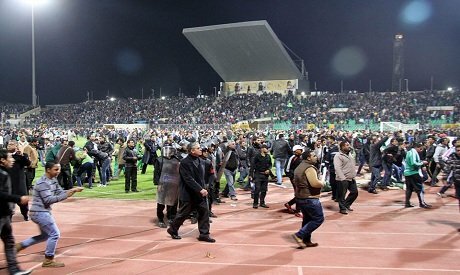 The riots began after a league game at Port Said stadium between local side al-Masry and Cairo club al-Ahly. The violence – Egypt’s worst football disaster – sparked riots in Cairo during which a further 16 people died. The sentences came after a day of clashes between security forces and supporters of the secular opposition. Hundreds of thousands took to the streets across Egypt to mark the second anniversary of the revolution that ousted ex-President Hosni Mubarak and voice their opposition to Islamist President Mohamed Morsi. At least seven people were killed in Friday’s unrest. Last year’s football riots led to the suspension of the league. It began when al-Masry fans invaded the pitch, hurling stones and fireworks at the visitors. At the time some fans – who said security forces appeared to do little to prevent the clashes – accused supporters of toppled President Hosni Mubarak of instigating the incident. Seventy-three people, including policemen, were tried. The judge said he would announce the verdict for the remaining 52 defendants on March 9.